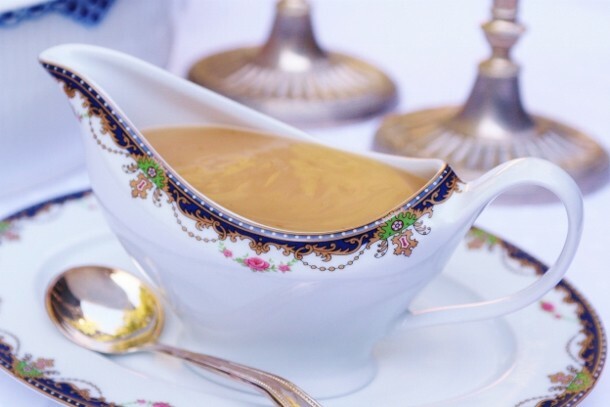 There are a couple of essential and easy steps that make lump-free gravy a no-hassle success. * When the turkey is finished cooking, transfer it to the carving board to cool. Spoon or pour all the great juices in the bottom of the roasting pan through a strainer, and discard the solids. 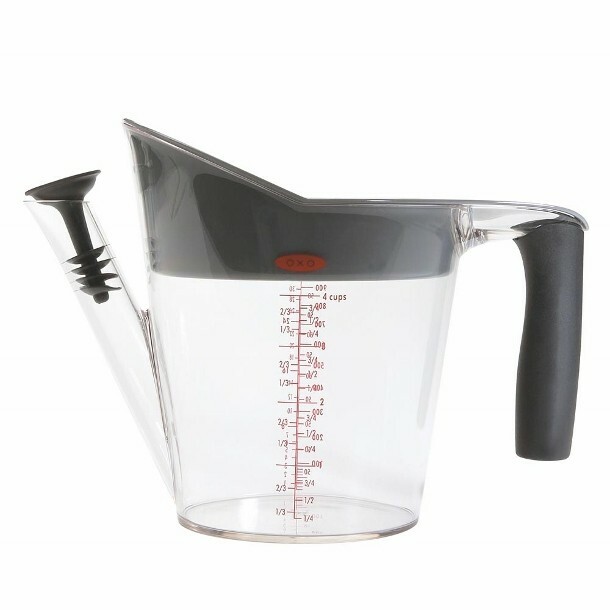 Place a large zip-top plastic bag inside a 4-cup glass measure. Pour drippings through a sieve into bag; discard solids. Let drippings stand 10 minutes (fat will rise to the top). Seal bag; carefully snip off 1 bottom corner of bag. Drain drippings into a medium bowl, stopping before fat layer reaches opening; discard fat. Okay, after you separate the juices, you will make a slurry with the flour—that is, mix flour with an equal amount of water to form a smooth mixture before adding it to the pan juices. This is the key to preventing lumps in your gravy. I love the silky texture and warm flavor of the gravy Ebo (aka David Bonom) and I did for Anolon. To take away any last minute hassle, chop the shallots and garlic ahead of time and store in a plastic bag in the refrigerator. Have the flour measured out and waiting in a small bowl. (But wait to make the slurry just before using). Place the butter in a saucepan early and have it ready and waiting on a back burner on the stove. Combine reserved pan drippings with enough chicken broth to equal 3 cups. Stir the flour into 3 tablespoons of water until the mixture is smooth. Melt the butter in a medium saucepan over medium-high heat. Add the shallots and garlic; cook, stirring occasionally, until golden, about 1 1/2-2 minutes. Add the sherry and cook until it is nearly evaporated, 1-2 minutes. Pour in the drippings and bring to a boil. Whisk in the flour mixture (slurry) , return to a boil and cook, stirring, until thickened, about 2 minutes. Stir in salt and pepper. Strain if desired. Anything with sherry in it has to be great…What sherry do you recommend?